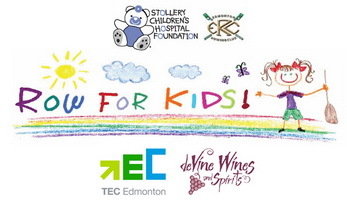 TEC Edmonton is participating for the first time in Row for Kids – Hardy staff and incubator tenants at TEC Edmonton have formed a crew of eight to challenge other corporate crews in a bid to raise funds for the Stollery Children’s Hospital Foundation. Race day is on Saturday September 8, 2012. Row for Kids is a joint fundraiser for the Stollery Children’s Hospital Foundation and the Edmonton Rowing Club. While PCL Construction Management Inc. initially conceived the program, Golder Associates LTD is the lead for Row for Kids in 2012. Race Day is always a blast as corporate crews battle it out for the opportunity to raise their hands in victory forever immortalized (cue We Are the Champions). Telford Lake in Leduc, Alberta is the locale for head-to-head races on a 750-metre course. Face painting, Balloon characters, jumping castles – oh my! Bring the kids along because there’s a lot to do at this family-oriented event. 2. Participants also need to purchase a bottle of wine to donate to the Grab: Any wine donated to the growing pool of wine (the prizes for the Wine Grab draw) must be purchased from deVine Wines & Spirits. 3. With each entry participants will receive a card containing a purchase code: Participants receive a 10% discount when they purchase their “wine donation” in person (must present card) at deVine Wines & Spirits or on deVine’s website (must indicate purchase code in the ‘Customer Comments box’ to receive the discount) – devinewines.ca. Random draws will determine the winners of multiples of four cases (or partial for the last draw). Please Note: A minimum purchase of $24.99 is required for the “wine donation”. All bottles purchased for the Wine Grab will be safely stored at Devine Wines after purchase (i.e. you purchase the wines at deVine Wines but you don’t take it with you). The more memberships you buy, the better odds of winning! TEC Edmonton will have a table set up at deVine Wines on Saturday September 1, 2012 from 11am to 3pm. Come on down to purchase your tickets for the Wine Grab, and sample some wines in the process. Can’t make it? Contact the TEC Edmonton Crew by email at tecwinegrab@gmail.com to inquire about participating. 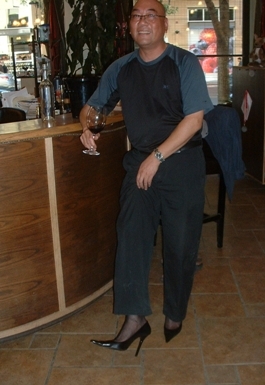 In the spirit of this fundraiser, Ed Fong, Managing Partner of deVine Wines, will serve wine to you in heels that evening. Hopefully, Ed will be joined by his male co-workers “man enough” to walk in similarly attired footwear. So please come out and show your support for a great cause. Veuve Clicquot and its instantly recognizable Yellow Label is one of the most renowned French Champagne houses. The luxury Champagne house is famous for its innovative accessories for its Champagnes. Every year, Veuve rethinks its coolbox collection, in order to offer their motto of “freedom to consume champagne anytime, anywhere”. 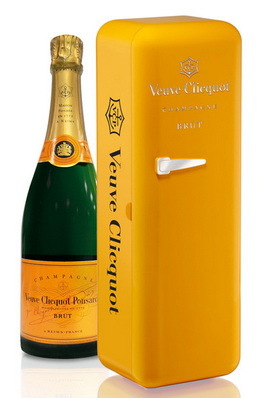 And voila, new to the Alberta market is the new giftbox, the Veuve Clicquot Fridge. Designed by Denis Boudard of QSLD Paris, this new coolbox design was inspired by the fridges from the 1950’s. It will fit any of the Veuve Champagnes and will keep it cool and at ideal serving temperature for up to 2 hours. Handy and aesthetically appealing, this re-usable, retro-chic and so very cool fridge box would be an ideal gift for any Champagne lover! It comes with a bottle of its famous Yellow Label NV Brut. This limited edition release will be in the market only briefly, so grab yours while supplies last.